Fulton, Md. 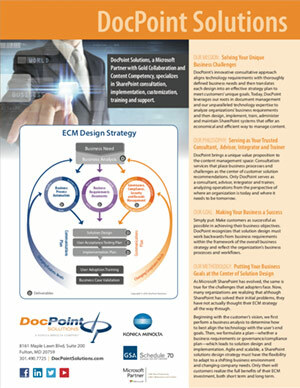 – March 13, 2018 – Quality Associates, Inc. (QAI), a Konica Minolta company, proudly announces that Scott Swidersky, president of QAI and its affiliate company DocPoint Solutions (DocPoint), has been promoted to the position of vice president of Konica Minolta’s Enterprise Content Management (ECM) practice, effective March 5, 2018. With more than 20 years of experience in the document management field, Swidersky holds a deep understanding of integrated solutions across the public and private sectors. In his new role, he will continue to oversee the overall management and direction of QAI and DocPoint while providing strategic direction for Konica Minolta’s overall ECM practice as the company continues to expand its business process outsourcing (BPO) operations, SharePoint development and Content Service solutions. Swidersky will now report to Richard Miller, vice president, Business Intelligence Services, Konica Minolta. Swidersky joined QAI in 1997 and launched its Information Systems Division. Initially developed as a BPO organization, the division quickly matured into a full-service systems integrator and value-added reseller (VAR). Within a few years, Swidersky established the division as a proven, reliable partner to organizations requiring innovative document/content management and ECM solutions. In 2008, Swidersky founded the QAI affiliate company DocPoint Solutions. A Microsoft Gold Certified Partner, DocPoint provides comprehensive, customized software, services and solutions that support all aspects of content services with a focus on implementing, training and supporting Microsoft SharePoint and its integrated suite of products. After many years of double-digit growth, QAI and DocPoint were acquired by Konica Minolta on September 1, 2016. Quality Associates, Inc. (QAI) provides customized solutions and services that turn printed materials and electronic information into useful, organized data that can be readily located and accessed by authorized users. From scanning and imaging to complete, searchable systems that bring information directly to the desktop, QAI offers complete systems integration, support and post-deployment training to ensure success. Founded in 1986 and located in close proximity to both Baltimore and Washington, D.C., QAI has grown significantly over the years into a trusted, experienced Value-Added Reseller (VAR) with an extensive electronic content management (ECM) supplier and partner network. QAI works with federal, state and local agencies; schools, colleges and universities; chemical and manufacturing companies; pharmaceutical, healthcare and medical research organizations; financial, accounting and law firms; professional associations; and many others. For more information, please call (800) 488-3547 or visit www.qualityassociatesinc.com. DocPoint Solutions is a Microsoft Gold Certified Partner specializing in implementing, training and supporting Microsoft SharePoint and its integrated suite of products. 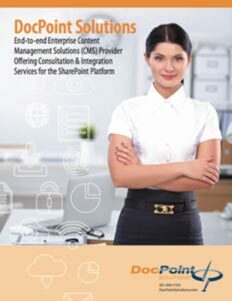 With a focus on enterprise content management (ECM) and document capture, the company provides comprehensive consultative services and support to a wide range of federal, state and local governments as well as private and commercial enterprises seeking to maximize the value SharePoint brings to their operations. By combining state-of-the-art solutions with document management expertise and innovative approaches to systems design and integration, DocPoint helps clients attain new levels of effectiveness and productivity. An affiliate of Quality Associates, Inc., DocPoint is headquartered in Fulton, Maryland. 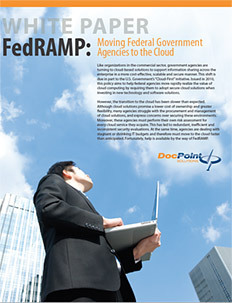 For more information, please call (301) 490-7725 or visit www.docpointsolutions.com. Konica Minolta Business Solutions U.S.A., Inc. is reshaping and revolutionizing the Workplace of the Future™ (www.reshapework.com). With our comprehensive portfolio, we deliver solutions to leverage mobility, cloud services, and optimize business processes with workflow automation. Our All Covered IT Services division offers a range of IT strategy, support, and network security solutions across all verticals. Konica Minolta has been recognized as the #1 Brand for Customer Loyalty in the MFP Office Copier Market by Brand Keys for 10 consecutive years and is proud to be ranked on the Forbes 2017 America’s Best Employers list. Konica Minolta, Inc. has been named to the Dow Jones Sustainability World Index for five years in a row. 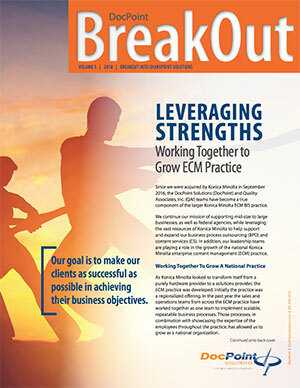 We partner with our customers to give shape to ideas and work to bring value to our society. For more information, please visit: www.CountOnKonicaMinolta.com and follow Konica Minolta on Facebook, YouTube, and Twitter @KonicaMinoltaUS.